North Korea's Grim Prisons: What Awaits the U.S. Journalists? Laura Ling and Euna Lee, the American journalists who were each handed 12 years in prison yesterday by a North Korean court for committing "hostile acts" by allegedly overstepping the border in March, have received a harsh sentence by Western standards of justice. The news is grim, to be sure. But former prisoners in Pyongyang's horrific penal system speculate that the pair may not have to endure the grimmest conditions, which very few have emerged to talk about. The Americans are likely to be separated from the general prison population and may be secluded from the true hardships of penitentiary life. That doesn't mean it will be easy. 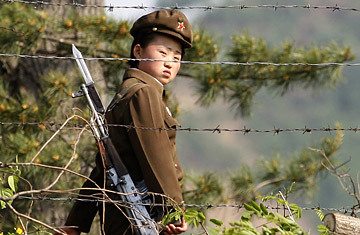 North Korea's prisons and camps are scary places, the horrors of which are gradually becoming known to the world. Indeed, Kim and others believe that while the two women will be treated differently, they will still probably be sent to a regular prison  called a kyohwaso, or reformatory  rather than a prison for political prisoners, where conditions are relatively better. Kyohwaso life is extremely harsh: scholars estimate only 50% of prisoners survive their first year. One of the first accounts of the North Korean prison system, a 2000 memoir called The Aquariums of Pyongyang, tells of routine torture and deprivations on par with those of Nazi concentration camps. The book's author, Kang Chol Hwan, was imprisoned in the Yodok concentration camp at age 9 for 10 years with his family. He suffered starvation and disease and was forced to attend public executions. "I attended some 15 executions during my time in Yodok," he wrote. Kang was imprisoned at the camp because his grandfather had been sentenced for suspicious behavior. "It's guilt by association," says Tim Peters, a Christian activist living in South Korea who has helped numerous North Korean defectors find safe havens in other countries. Kim Tae Jin, president of a Seoul-based organization called the North Korean Gulag Shutdown Movement, spent four years in Yodok for trying to escape the country. "I was always hungry and cold," he says, recalling life in the camp. He remembers scavenging for dead rodents and snakes to eat. "When I found one, that would be a good day," he says. At his camp, it "was normal for the prison guards to be cruel. No one had hope or cared about anything," says Kim, who was finally released. The camps' pervasive sense of hopelessness is a common theme woven through many defectors' accounts, says Peters. "Any sense of justice is completely absent," he says. "People often don't even know what their crime is. It is really grim stuff." These stories come from North Korean survivors who did not have the potential advantage of the world's attention as they served out their long and difficult sentences. Lee and Ling have the Obama Administration moving on their behalf; the White House has already urged North Korea to release them "on humanitarian grounds." Sources knowledgeable about North Korean politics and prisons say Pyongyang will not allow the high-profile prisoners to starve to death, die of disease or endure torture. Small comfort. In any case, since their detention in March, the journalists have been visited by representatives of Sweden's embassy in Pyongyang, and over the weekend, some news outlets reported that former U.S. Vice President Gore may also be trying to go to North Korea on their behalf. How quickly those outside influences will make their way inside North Korea's camps, however, remains to be seen. Read "Why North Korea Nabbed Two U.S. Journalists."